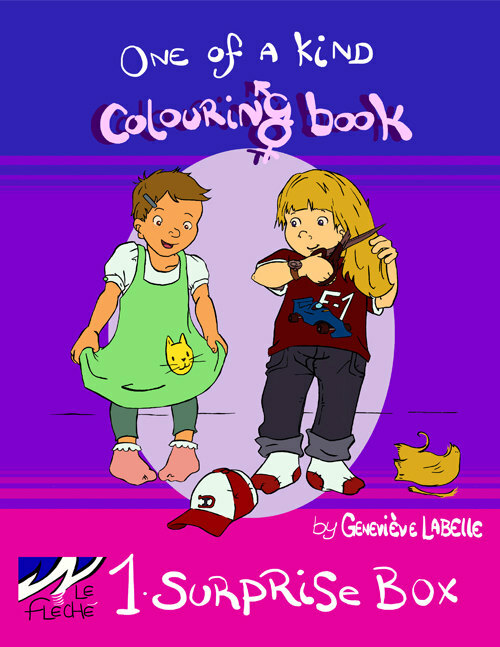 I have found THE NEATEST coloring book about gender identity for C.J. It’s called One of Kind Colouring Book 1. Surprise Box and it was sent to me by author/illustrator and Raising My Rainbow reader Geneviève Labelle of Montréal, Québec. “At one time, there was pink-only colouring books aimed at little girls filled with princesses and charming princes and blue-and-khaki-only colouring books roaming with superheroes and brave firemen. Between them, nothingness. The nature of each one of us is more complex than what is offered by the mass culture industry for which colouring books are powerful promotional items. Geneviève Labelle proposes an heteroclite collection of drawings that incites us to rise above stereotypes. This page from the book is soooooo C.J. C.J. loves the coloring book and it provides a humorous read for adults too. To learn more or order, click here. To win a copy of the book, leave a comment below. The winner will be announced next Friday. Good luck! Enrollment is open for Camp Aranu’tiq in California. Camp Aranu’tiq is a weeklong, overnight summer camp for transgender and gender-variant youth ages eight through 15. It’s a place where life experiences are shared and lifelong friendships are made. The dates are Sunday, June 30, through Saturday, July 6, and space is limited. There is a camp in New England as well. Learn more about both camps by clicking here. The first LGBTQ-inclusive Jewish Children’s book in English is out. 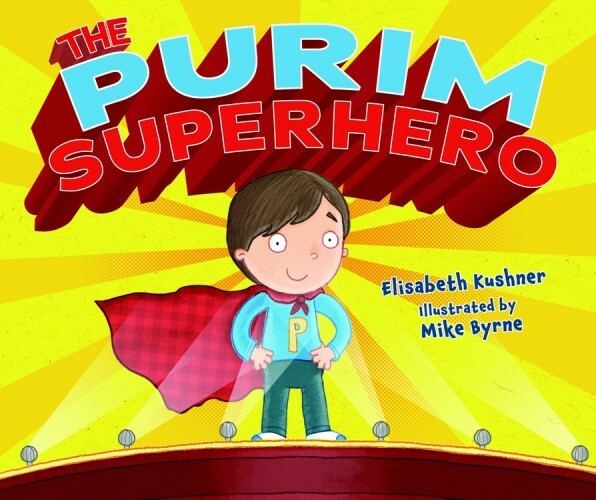 The Purim Superhero is about Nate who loves aliens and really wants to wear an alien costume for Purim, but his friends are all dressing as superheroes and he wants to fit in. What will he do? With the help of his two dads he makes a surprising decision. Published by Kar-Ben Publishing, an award-winning publisher of Jewish children’s books, the manuscript is the winner of Keshet’s national book-writing contest. Have you seen this rad teenager? Watch as this high school senior publicly tells 300+ students that he is an LGBTQ teen. The applause and cheers that he gets make me giddy and his strength gives me hope. The people who raised him did something right. This entry was posted in All Posts and tagged Camp Aranu'tiq, gender identity, One of Kind Colouring Book, The Purim Superhero. Bookmark the permalink. I’ve been reading your blog for about a year now and it has been so wonderful to follow your, CJ’s and your family’s journey. I’ve got a 15 month old at home so I’ve just started this parenting adventure and I find your perspective enlightening, helpful, and ever-so-hopeful. The themes and values that you bring up in your stories are universal and meaningful to ALL parents and care-providers of ALL kids. Thank you for sharing, and being such an invaluable resource to this new mama. This post is very timely. I took my four-year-old boy/girl twins to a kid’s birthday party this weekend. The staff person at the play space was handing out the party favors at the end of the party and each kid got a coloring book. She was automatically handing girls the princess coloring book and all the boys got the car coloring book. I asked her politely if she would please give each of my kids the choice between the two books. My daughter still chose princess and my son chose cars but they were shown they had a choice at least. After I asked the staff person to give my kids a choice she started asking the rest of the kids which book they wanted instead of just handing them one. I was very happy about that! Baby steps! My son, who is quite the artist, would LOVE this coloring book. That video you posted was beautiful. I couldn’t imagine coming out to my entire high school, so I know that took a lot of courage from that young man. I know a little girl at my school who could really use this. I don’t know how her parents would feel about it though. I told her one day when we were talking about clothes, and how she likes her boy clothes better, that I didn’t care what clothes she wore, that I would like her just the same. Now, she is my very best friend! Considering that this is a Christian preschool, I think they are pretty accepting and understanding, but I wonder how they’d feel if she were a boy wearing girl clothes. Can someone from another country (namely: Brasil) win it too? The coloring book would be a huge hit in our house! Lgbt gender identity children’s books! Crazy! makes me feel like I just came out from living in the bushes. I actually just want to see it. It’s like when we went to the alternative parenting show and got sheets of stickers depicting different types of families. I think there were about 30 stickers on it. Funny how important the little things are, right? As always, thank you for sharing your journey, C.J.’s Mom! My son would love this. He is constantly snatching up his sister’s coloring books bc they are the “pink” version that the mainstream is so very fond of for little girls. I’ll have to check into this as well as your other recommendations. Great find! I would love to have something like this for my daughter to remind her that we are not all the same! I’m a social worker and would love to win this for some of my clients. Thank you! My five year old princess boy would LOVE this coloring book!! I am always trying to find stuff like this! Thank you so much for sharing!! That coloring book is awesome! I would love it for my sons. I teach them through example every day to treat everyone with respect and that differences are what make people special. Wonderful. I am sending his to my wife to see if there is a need in her school division. Thanks for this. I would love to win the coloring book for both of my grandsons. I think this is a great book to share with children my nephew loves princess stuff so when i tell him about C.J he tells me that it makes his day better after coming from Pre K after being teased for the way he acts so this is wonderful. I can’t wait to see more of the coloring book. It will be a great resource for my trainings. Very brave and upstanding young man in the vid. If only all of them were that way and all people had that level of bravery to be who they truly are. There would be a lot less hate in the world in general, I’d think. Love your blog. You have been an inspiration for me regarding my sweet gender non conforming son. Thanks for sharing your story, experiences, thoughts, and suggestions. In a way you are a cyber mentor for me……so THANKS!! If I don’t win, I’m getting it for my son no matter what. He would think this was about him! Thank you CJ’s Mom, please don’t ever stop your blog! This coloring book is great. Thanks for sharing!!!! just had a discussion with friends about how to educate special needs kids about gender identities, relationships, and various configurations of families. This coloring book will be added to my list of recommended materials! 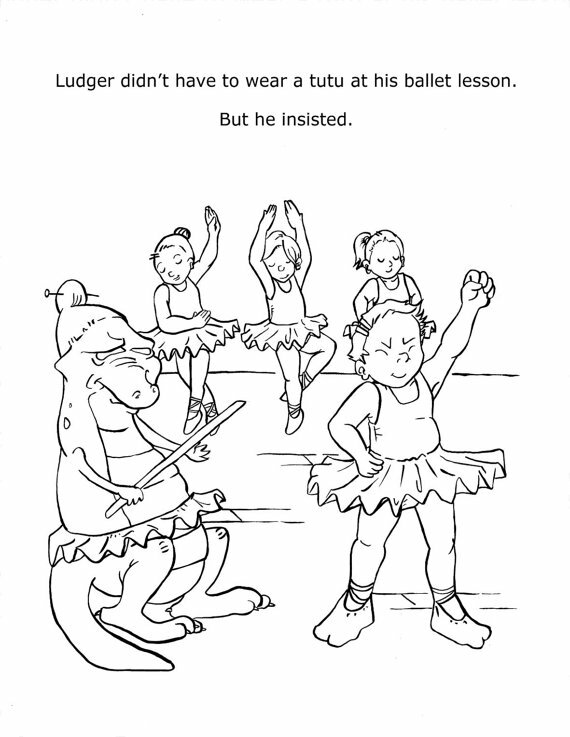 I would love to use this coloring book in our religious education program at church. Love it! Fantastic! If I’m not the lucky winner I will definitely be ordering a copy. Will also add it to my resource list on my website! I love that colouring book! My grandson L.C. LOVES pink… from his pink skating helmet, to his pink converse runners, to his pink bike and his pink cheeks! I love that he loves pink. He painted me a picture when he was 2, I can see it from where I sit — it’s a solid pink canvass. I’m not sure who he’ll love in life, but I know for sure that he’ll be given the choice because of the parents he has. I love that I raised a woman who loves a man who together allow their child, my grandson, to proudly love PINK! That coloring book sounds fantastic! How’s this for a post : Thanks for your purchase! Your order from CreationsLeFleche is complete. 🙂 Sofia is going to love it. This is fantastic. I have a similar situation at home with my daughter, she however loves everything Dinosaurs and it’s so difficult to find any dinosaur attire in the little girls section so I shop on the boys side of every department store. She associates with mostly everything that appeals to her boy counterparts and so I identify a lot with what you share. I have struggled with finding ways to GIRL out her outfits but I realize, it’s not her. So I let her choose, I refer to the Brangelina offspring Shiloh when I talk about my daughter, she reminds me of little Shiloh…..thanks for sharing. I think this coloring book is wonderful. I would like to win this for my nephew. He has many gender creative people in his lives and I know he would enjoy this! I would love to share that coloring book with my family! What a cool guy in the video. Love him… love you for sharing, and love your whole family for bringing us an opportunity to grow more loving! Would love to win the coloring book for my daughter 🙂 Never heard of this book. Thanks for the list of other good recommendations too!